Jessica Southern recently transitioned to a new role as Key Relations Manager at FIMRC HQ after spending more than seven years as Field Operations Manager at Project Limon, Nicaragua. Jessica is sharing her insights on the value of partnerships since she took on this new role. Earlier this winter, FIMRC partnered with Michigan State University’s Leadership in Medicine for the Underserved (LMU) program. Sixteen third- and fourth-year medical students volunteered across five of our sites: Costa Rica, India, Uganda, Ecuador, and Peru as part of our Comparative Healthcare Immersion Rotation Program (CHIRP). The group in Huancayo, Peru learned first hand the struggles of project development and discovered that addressing community needs often requires analysis and flexibility. “We found that many of the moms [in the community] were worried about the hygiene of the children, their behavior problems and lack of academic achievement. We were hoping to find habits that we could easily change like brushing teeth, washing hands, recycling, but instead, we found that the actual needs of the site were more abstract concepts that would be harder to quantify and combat. We are hoping to fine-tune our plan for the overall curriculum and individual lessons. Helen and I started researching techniques for behavior management and how to get children to focus on academics. This will certainly be an ongoing process, but we hope that our efforts will have an overall positive outcome on the yearlong program,” said Maria Bule. 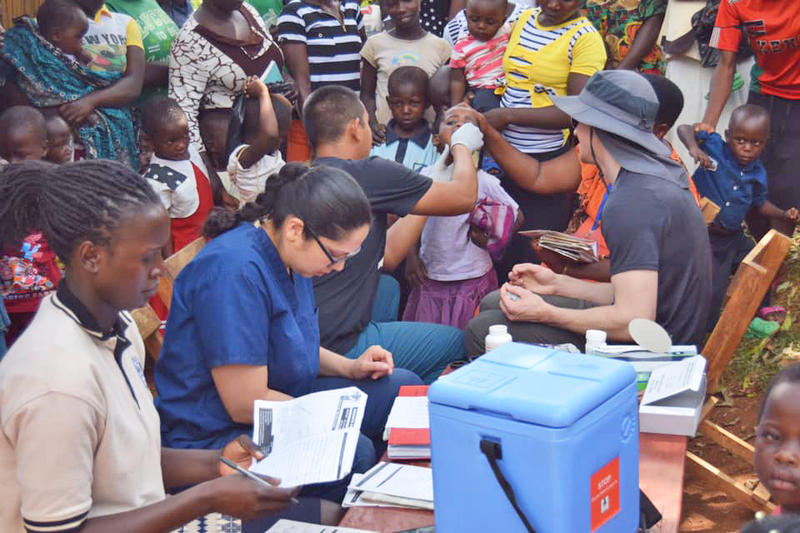 Despite these different CHIRP experiences, one common theme emerged: all the students were able to immerse themselves in the communities and healthcare systems they were serving and will take the lessons they learned during their time with FIMRC with them throughout their medical careers. Undergraduate students also make a tremendous impact at our sites. We are looking forward to many undergraduate student groups spending their spring breaks volunteering with us, such as the University of Alabama’s Alternative Breaks group, “Beyond Bama.” Students traveled to Costa Rica and the Dominican Republic for a week, volunteering at local health clinics, conducting community outreach, and leading youth empowerment groups. We are also excited to see many undergraduate and graduate students take advantage of our extended summer travel opportunities through our Summer International Health Fellowship (SIHF) program. The SIHF program is especially close to my heart because these volunteers were so important to our work during my time in Nicaragua. One group that stands out in my memory is the Morehead Cain Scholar program. These students always make the most of their time on site, learning as much as they can while making a lasting contribution through the development of quality improvement programs and sustainable projects. Here at FIMRC HQ, we can’t wait to see what the spring and summer have in store for our many student volunteers. We know their positive impact will be felt in the communities for many years to come and we hope that their experiences with FIMRC will continue to guide and influence their lives. It is a privilege to work with our many different partners, especially colleges and universities. I look forward to growing our community of student volunteers and seeing the work they do at all of our sites. Thank you to all of you for the hard work that you put in so far this year! No matter your background, you can make a lasting impact.